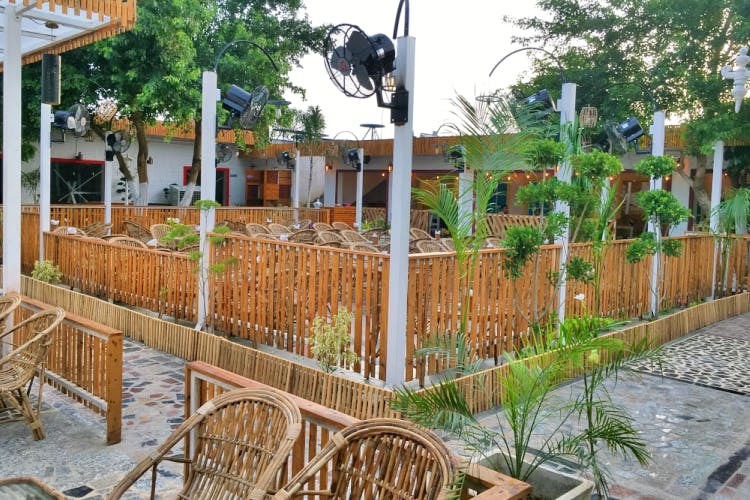 An elegant, expansive restro-bar that lets you bring your own booze – the new The Friends Republic Villa promises a fun evening. Gurgaon’s famous ahaatas have come a long way! They’re no longer dingy watering holes on the side of a ‘theka’. Case in point – The Friends Republic Villa. Choose between cheery white and yellow interiors with glass top tables that house a variety of spices or step outside and sit in the courtyard with cane furniture and loads of foliage. Pick up the booze of your choice from the vendor outside and let the Friends Republic Villa handle mixers and food. The choice of liquor labels is extensive since you’re buying from a store, so that’s always a good thing and the menu at The Friends Republic is as big. They have everything from disposable glasses to ginger ale and tonic water for your own bar at your table. Don’t miss the Honey Chilli Potato, which should be the signature dish at all these watering holes. The meat equivalent for this i.e. the Chilli Chicken was yummy but we loved the BBQ Wings and Fried Chicken a wee bit more. Other suggested food pairings include Chicken Tikka, Amritsari Fish, Shahi Paneer and Dal Makhni. Finish with gourmet paan at Paan Singh next door – they have over 30 different types of paan to choose from.